Delivering our Born to Ride programme and getting local families cycling has been incredibly rewarding. We set up the intergenerational project to encourage local young people and their parents, grandparents or carers to take up or get back into cycling and do something healthy and fun together. 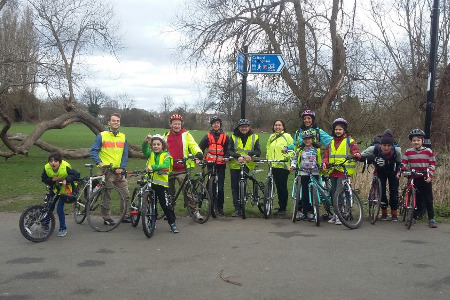 To achieve this we offer courses that consist of five or six bicycle maintenance sessions, cycle training and a group ride to demonstrate local cycling routes. The sessions take place in our bicycle workshop which sits in amongst the gardens and chickens at our site in Forest Hill. We want to promote cycling to as many people as possible, and therefore we have tried to limit the barriers people may have in taking part in our courses: all sessions are completely free, open to all and we are able to offer participants bicycles to work on and ride if they do not have their own. To promote our courses we have linked with several local schools, community organisations and referral agencies in our local community, and so far we have trained over fifty people in the borough. I have really enjoyed delivering the sessions so far, and the feedback we have received from participants has been fantastic: we have heard that family members are now riding to school and work, going out on group rides together, and even repairing old bikes for brothers and sisters. The other great thing for me, as the course tutor, has been bumping into the families cycling whilst I’m out on my bike in the area. The grant from Cycling Grants London has been extremely useful for us at The Young Lewisham Project as it has enabled us to equip our workshop with tools and spares for participants; to promote our courses; and to offer families cycling essentials, such as puncture repair kits.